Perfect for Spring, Summer and Fall, the Dainese Hydra Flux D-Dry Jacket is a one and done jack of all trades. With massive boomerang mesh panels and a removable waterproof D-Dry membrane, the Hydra Flux D-Dry gives you relief from both warm and wet weather, while removable composite elbow and shoulder protectors, as well as a pocket for Dainese's G1 back protectors, allows this ultra light and versatile jacket to also serve up some unrivaled protection. This jacket by Dianese is so helpful for hot humid summers! I am so grateful I bought this. I had been wearing my leather jacket all summer and was constantly hot and sweaty on my R6. My bike runs hot to begin with. Couple that with a 90 degree day and I felt like I was on fire. This jacket has a lot of good airflow once the inner liner is taken out. I have also worn this in the rain and the waterproof liner does hold up pretty well too. I would definitely recommend this to any female riders looking for both style and usage. I also added the back protector. I will likely be wearing this all summer next year! Nice jacket but I had problems with fit, colors and protection. I ordered the black and fuscia and it does not look like the photo. It is actually black grey and pink. There are three colors, and the fuscia is more like a hot pink. I am 5', 104# so I tried the 38 and 40. The 40 was too big and the 38 was not flattering. I have a small chest, yet it pulled so tight when it zipped that the fabric "whiskered". Then it was loose around the midsection. 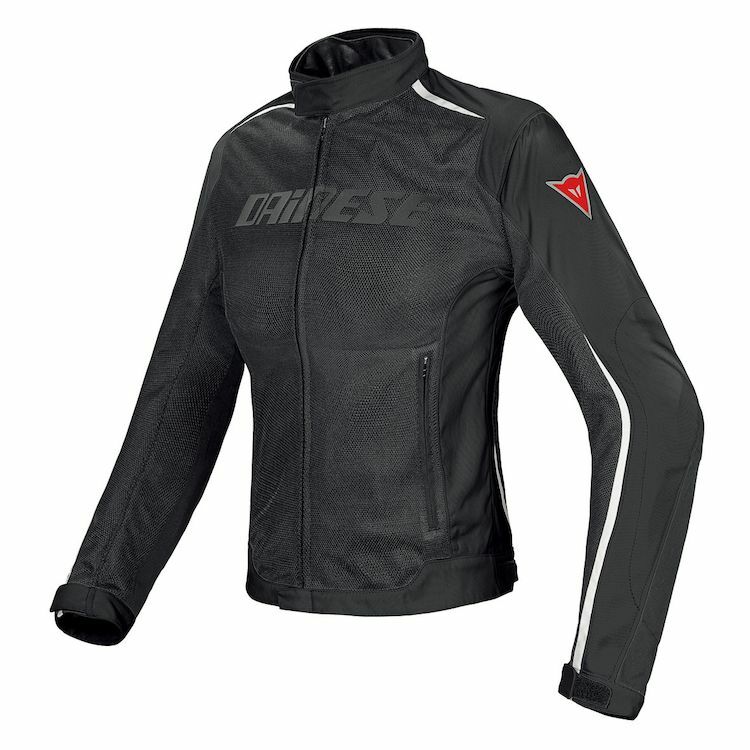 I own and have tried other Dainese jackets that fit perfect. I added my own back protector to see if that would help with fit and it did not. Also, I was disappointed that the pocket only came about half way down my back, no protection on the bottom. The quality and ventilation seems very good though and its a good looking jacket. I checked yes to recommending this jacket, because if you have all the information first, it may be perfect for you. Very comfortable and lightweight. Great design and style. I am 4'11, around 100lbs. The size 40 fits me comfortably. Not too snug, enough room for a light hoodie underneath. If I wanted an even tighter fit I'm sure the 38 would fit me too, but I like the option of layering when the weather gets cooler. The jacket is gorgeous, I got the red. It is very eye catching. I am a bit disappointed in the features though. It is a very lightweight jacket and from what I can find has two pockets in the front, but they are mesh and see-through. No inside pockets anywhere else. No extra protection other than the elbows and shoulders, not even a small pad in the back. I will be buying the back protection to beef this jacket up more. The inside zipper to the waterproof lining feels very flimsy and I am scared of using it too much and it breaking. It already takes a little bit of tugging to get it to go up and down and I hope it holds up. Other than wishing it had more pockets, at least a waterproof one inside, or heck it doesn't even have to be water proof, just a pocket where I can zip up my ID and phone and it not be visible through mesh and more enclosed. I feel the back protector is a must with this jacket. Other than that, the fit and style is amazing. I feel the cut is nice and gives more shape than just a boxy cut jacket. It is very comfortable. Wife needed a summer jacket. She loves it. My wife needed a riding jacket for Hawaii. After extensive research, this jacket seems to be the best balance for heat and protection. She loved the red color and we hope it's great when it arrives. Great looking and fair protection. Sleek styling while keeping my wife cool and protected. Great jacket, I bought it for my wife and she loves it. Can anyone tell me if the D-Dry removable membrane is wind resistant or wind proof please? BEST ANSWER: To add onto the question above, is this jacket 100% wind proof or just wind resistant? Also, is it 100% waterproof as well? or just water resistant? Looking for something to take for a trip cross country. Are there any zippered vents anywhere on this jacket? BEST ANSWER: No, it is all mesh (front, back & arms). Does this jacket have a full zip to connect to Dianese pants? I currently own the Women's Drake Textile Pants. BEST ANSWER: Hi Enya, after thoroughly checking out my girlfriend's jacket, it doesn't appear that it's able to zip to any pants whatsoever...just purely a great, stand-alone jacket. I hope this helps.